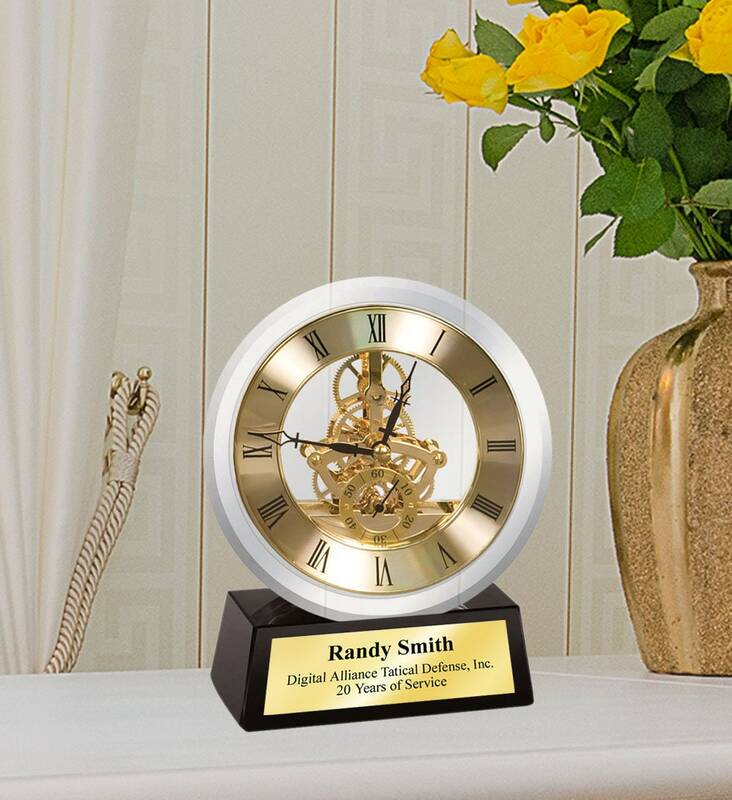 If you want to give a gift of appreciation or recognition of a deserving employee, retiree, boss, colleague or simply a wedding gift, then look no further than our heavy crystal round moon circle shape Da Vinci golden gear clock. This stylish and eye-catching clock gift product features a DaVinci gold moving gear clock encased in a brilliant clear round crystal on a midnight black crystal base. ► Contact us through Email info [!at] AllGiftFrames.com or TEXT us at 714.227.8735 or put info in "Note to Seller" field box and let us know what you want to engraved on the Gold engraving plate. ♥ Overall Crystal Clock measures 5.5" x 4.5" in dimension. Personalized wood desk clock with silver engraving plate. Congratulation engraved desk clock with distinction. This beautiful engrave desk clock makes a unique retirement, employee recognition, wedding, anniversary or graduation gift present. A unique table desk clock gift idea for coworker, employee, boss, girlfriend, boyfriend, wife, husband, etc.... Personalized clock gifts by Framing Achievement, Inc. creation. Rating high on style and elegance, Framing Achievement's personalized poem photo gifts are the first choice in premium poetry presents for Anniversary, Birthdays, Weddings, Retirement, Graduation and many more occasions. Let our personalized engraved desk clock gift products imagination wander and explore the possibilities that you can create with a custom sentimental meaningful message in our elegant clock gifts. Beautiful Employee Service Award and Recognition Retirement Gift Clocks with Free Engraving. Ordering a recognition clock award for your employee or executive has never been easier. We sell desk clocks, glass clocks, personalized employee clock gifts and crystal award trophies at wholesale prices. Each desk clock gift and employee service awards are unique executive and employee appreciation gifts.. Browse through our personalized clock award store and you will find unique employee recognition items such as award clocks, appreciation gift, corporate gift, business corporate gift, corporate executive gift, engraved corporate gift, plaque trophy award and employee promotion gift ideas.